Affordable Web Design: What the heck is a wordpress theme? Creating, developing and deploying a full website is not an easy task. Many business owners and marketing directors/managers usually find themsleves trying to understand all the different posibilities to develop a site, and end up scratching their heads puzzled by this question: how would it ultimately work? >> Thinking about redesigning your website? 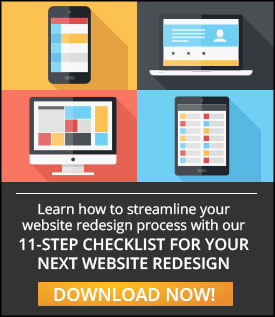 Download your 11-step website redesign checklist! What is a Wordpress theme: A theme is a set of files used to determine the visual look and feel of your website. Themes include information about the general structure and layout of your site, as well as other content such as headers, footers, text and images. Themes also allow you to control the overall functionalities such as navigation features and other user interactions such as form submissions and such. What type of theme should I get: There are a bizillion different themes out there, free and premium. There are quite a few good free themes, but premium ones will always give you more flexibility in terms of design, documentation and support. Of course, a custom theme should always be your preferred route as you can have more control in terms of the quality of the front end as well as the CMS. Theme design and UX: Your design will affect your website marketing objectives a lot. A well thought-out design and UX strategy will allow you to decide placement of imagery, text and other CTAs (calls to action) in your layout. This will help you optimize the user's journey and buying time and cycle. Responsiveness: With most of us on-the-go, your theme should be able to deliver your site on all platforms without losing quality of content or ease of use. This is pretty much mandatory for all and any website since Google announced their new mobile algorithm. If you're unsure if you're current theme or site is responsive, visit Google's new mobile frienly test. In web design, Wordpress is a very powerful and easy-to-use-tool if you know what you're doing. This means that, like any other website approach, themes should be built with quality in mind. Obviously, a website is a very organic entity, which makes no theme perfect, and you’ll almost always have to make some compromises. Hopefully, this post has given you more information to understand what a Wordpress theme is and what to have in mind when creating one so it includes the features that your business really needs, not necessarily the features that you want.